New edition of windows 10 has brought many new shortcuts to make more comfortable our daily browsing through desktop as well as INTERNET . 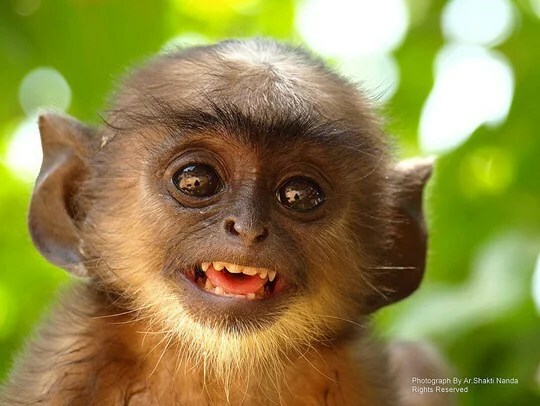 Here I am presenting a list of keyboard shortcuts for Windows 10 to make easy your life . So have a enjoy . 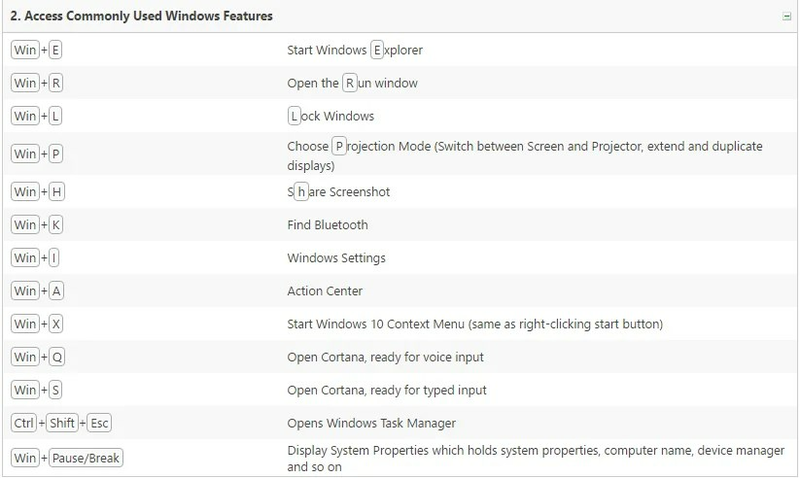 WINDOWS+A – Appears Action Center where you will get notification , settings like table mood button , the brightness button as well as others . WINDOWS+S –Opens Cortana from where users can search files , folders, programmes on the computer or internet .User can also use this by voice command . WINDOWS+Ctrl+Right arrow – Turns the Virtual Desktop to the right of the current Virtual Desktop. WINDOWS+Ctrl+Left arrow – Appears the Virtual Desktop to the left of the current Virtual Desktop. WINDOWS+Ctrl+F4 – Back to the normal screen from virtual desktop if there is one virtual desktop or it shows the earlier virtual desktop that you’ve set up more than once. There are also some useful shortcuts that also are used by many users . Some common shortcuts are given below . Ctrl+Z – Undo the previous action. Ctrl+R (or F5) – Refresh the active window. Ctrl+Y – Redo an action. Alt+Tab – Switch between open apps. Windows 10 will bring up a screen the open windows and cycle through them each time by using Alt+Tab. Alt+Left arrow – Go back if the program has a screen history, like in browsers or File Explorer. Alt+Right arrow – Go forward. Alt+Page Up – Jump up one screen. Alt+Page Down – Jump down one screen. Alt+Tab – Switch between open apps and keep the Alt key down and use the Arrow keys to skip over some windows in the cycle. Ctrl+Alt+Tab – Use the arrow keys to switch between all open apps. F2 – Rename a selected item, like a file in Explorer. F3 – Search for a file or folder in File Explorer. F4 – Display the address bar list in File Explorer. F5 – Refresh the active window in File Explorer or Microsoft Edge/Internet Explorer. F6 – Cycle through screen elements in a window or on the desktop and File Explorer. This shortcut changes the selection or insertion point. For example, in File Explorer it chooses a file, then a folder along the left, and finally the address bar above the list of files/folders. F10 – Activates the menu bar or turns on the letter shortcuts (see the File Explorer image below) so the user can select the items with the letter or number keys showing on the screen. Alt+F4 – Close the active item, or exit the active app. Ctrl+F4 – Close the active document (in apps that are full-screen and allow you to have multiple documents open simultaneously). Shift+F10 – Display the shortcut menu for the selected item. Ctrl+Right arrow – Move the cursor to the beginning of the next word. Ctrl+Left arrow – Move the cursor to the beginning of the previous word. Ctrl+Down arrow – Move the cursor to the beginning of the next paragraph. Ctrl+Up arrow – Move the cursor to the beginning of the previous paragraph. Ctrl+Shift with an arrow key – Select a block of text. Shift with any arrow key – Select more than one item in a window or on the desktop, or select text within a document. Ctrl+arrow key (to move to an item)+Spacebar – Select multiple items in a window or on the desktop. Use this to quickly select a group of files, pictures or icons on the desktop. Ctrl+Esc – Open Start for those time when there’s no WINDOWS key on your keyboard. Ctrl+Shift+Esc – Open Task Manager. Ctrl+Shift – Switch the keyboard layout when multiple keyboard layouts are available. This is great for people who use multiple languages with their PC. Ctrl+Spacebar – Turn the Chinese input method editor (IME) on or off. Shift+Delete – Delete the selected item without moving it to the Recycle Bin first. Right arrow – Open the next menu to the right, or open a submenu. Left arrow – Open the next menu to the left, or close a submenu. Esc – Stop or leave the current task. The following use the WINDOWS key. 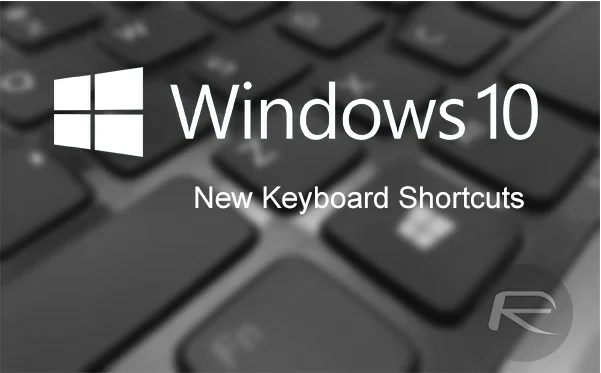 See the list of brand new Windows 10 keyboard shortcuts above for a few more keyboard shortcuts that use the WINDOWS key. WINDOWS – Opens or closes the Start menu in normal mode or the Start screen in tablet mode. WINDOWS+B – Puts the focus in the Taskbar notification area so that users can work with the icons in what they used to call the system tray using the Spacebar to select and arrow keys to move between them. Read Also: What is Windows RE? How to boot to Windows Recovery Environment? WINDOWS+E – Open File Explorer. WINDOWS+G – Open Game bar when a game is open. WINDOWS+H – Open the Share feature which comes in from the right side, like the charm from Windows 8. WINDOWS+K – Open the Connect quick action to connect to a wireless display. WINDOWS+M – Minimize all windows. WINDOWS+O – Lock device orientation so the screen won’t rotate anymore. WINDOWS+P – Choose a presentation display mode. WINDOWS+R – Open the Run dialog box. WINDOWS+T – Cycle through apps on the taskbar. After using this key use the arrow keys to move between the pinned or running programs on the Taskbar. WINDOWS+V – Cycle through notifications. WINDOWS+Shift+V – Cycle through notifications in reverse order. WINDOWS+X – Open the Quick Link menu which you can also open by right clicking on the Windows button on the lower left corner. This includes shortcuts to things like Control Panel, settings areas and the Run dialog box. WINDOWS+Z – Show the commands available in an app in full-screen mode. WINDOWS+COMMA – Temporarily peek at the desktop until you release the WINDOWS key. WINDOWS+Pause – Display the System Properties dialog box. This one’s often not available on many modern keyboards. WINDOWS+Ctrl+F – Search for PCs (if you’re on a network). WINDOWS+NUMBER – Open the desktop and start the app pinned to the taskbar in the position indicated by the number. If the app is already running, switch to that app. WINDOWS+Shift+NUMBER – Open the desktop and start a new instance of the app pinned to the taskbar in the position indicated by the number. WINDOWS+Ctrl+NUMBER – Open the desktop and switch to the last active window of the app pinned to the taskbar in the position indicated by the number. WINDOWS+Alt+NUMBER – Open the desktop and open the Jump List for the app pinned to the taskbar in the position indicated by the number. WINDOWS+Ctrl+Shift+NUMBER – Open the desktop and open a new instance of the app at the given place on the taskbar as an administrator. WINDOWS+Tab – Open Task view. WINDOWS+Ctrl+B – Switch to the app that displayed a message in the notification area. WINDOWS+Spacebar – Switch input language and keyboard layout. WINDOWS+Ctrl+Spacebar – Change to a previously selected input. The following shortcut will help to manage windows by moving windows around the screen or quickly maximize and minimize windows. WINDOWS+Shift+M – Restore minimized windows on the desktop. WINDOWS+Up arrow – Maximize the window. WINDOWS+Down arrow – Remove current app from screen or minimize the desktop window. WINDOWS+Left arrow – Maximize the app or desktop window to the left side of the screen. WINDOWS+Right arrow – Maximize the app or desktop window to the right side of the screen. 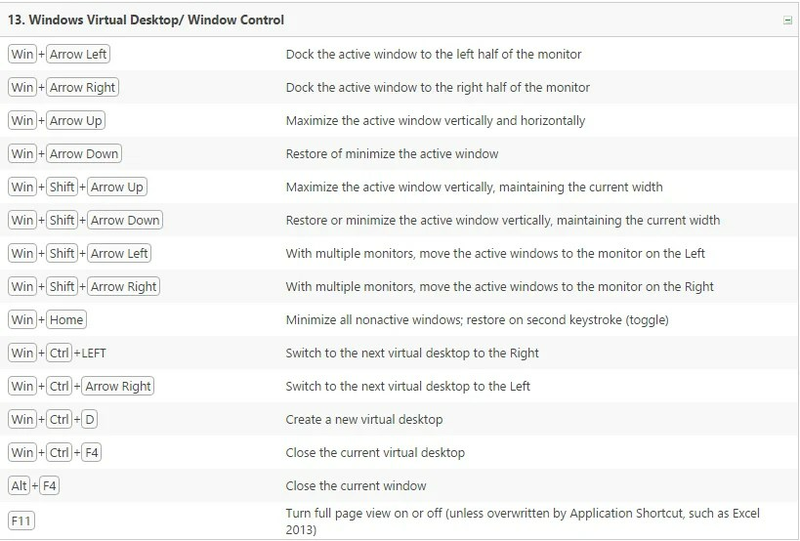 WINDOWS+Home – Minimize all but the active desktop window (restores all windows on second stroke). WINDOWS+Shift+Up arrow – Stretch the desktop window to the top and bottom of the screen. WINDOWS+Shift+Down arrow – Restore/minimize active desktop windows vertically, maintaining width. WINDOWS+Shift+Left arrow or Right arrow – Move an app or window in the desktop from one monitor to another. WINDOWS+U – Open Ease of Access Center. WINDOWS+forward slash (/) – Initiate IME reconversion. WINDOWS+plus (+) or minus (-) – Zoom in or out using Magnifier. Through the Windows File Explorer , users see their files on the computer , there are keyboard shortcuts to work with files smarter. Alt+D – Select the address bar. Ctrl+E or Ctrl+F – Select the search box. Ctrl+N – Open a new window. Ctrl+W – Close the current window. Ctrl+mouse scroll wheel – Cycles through the various views of files and folder sizes and list modes. Scroll the wheel while pressing the Ctrl button to change between views. Ctrl+Shift+E – Show the subfolders inside a folder. Ctrl+Shift+N – Create a new folder. Alt+P – Shows the preview pane to see the contents of a file without opening it. Only works with certain file types like Office documents, images or videos. Give it a try with your favorite file types. Alt+Enter – Open the Properties dialog box for the selected item. Alt+Right arrow – View the next folder. It cycles through the history of which folders you’ve viewed recently. Alt+Up arrow – Jump to the parent folder that contains a subfolder. Alt+Left arrow – View the previous folder. It cycles through the history of which folders you’ve viewed recently. Backspace – View the previous folder. It cycles through the history of which folders you’ve viewed recently. Right arrow – Display the current selection (if it’s collapsed), or select the first subfolder. Left arrow – Collapse the current selection (if it’s expanded), or select the folder that the folder was in. End – Display the bottom of the active window. Home – Display the top of the active window. F11 – Maximize or minimize the active window. Don’t forget to like facebook page and subscribe our youtube channel . Just it will be lots of inspiration to us . Great Piece of Information on Windows 10 Keyboard Shortcut really enjoyed it.